In the run up to the Harry Potter: A History of Magic exhibition, J.K. Rowling goes behind the scenes at the British Library to reveal some of the real-life counterparts to her characters. Celebrating the 20th anniversary of the first Harry Potter book, with footage from the British Library's Harry Potter: A History Of Magic exhibition. Having read all the Potter books, thanks to my elementary school-teaching sister, and seeing all the movies, I was looking forward to this. By the title, I thought it was going to be all about Hogwarts, Harry, and all his friends. That's not quite what it turned out to be. A documentary in style, and narrated by Imelda Staunton , who played Dolores Umbridge in the Potter movies, it features the musings of J.K Rowling and snippets of the books read by secondary movie cast members, including Evanna Lynch/Luna Lovegood, and Mark Williams/Mr. Weasley. A few bits of interviews with Potter fans is also included. Rowling spent time at the British Library, looking at rare books on magic, alchemy, and medicinal herbs, and gives her thoughts on the subjects. The library was going to host an exhibit on magic and Potter. I was about half way through the one hour viewing time when I realized that the direction of the documentary was a little wobbly. 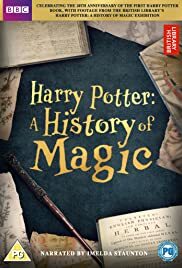 It's as if they couldn't decide whether they wanted to do a documentary on the history of magic in general, or Rowling and Potter in particular. What it ends up doing is a disservice to both, I think. I'd have preferred they chose one path and stayed on it. Potter fans will like it, I'm sure (I'm glad I saw it), but I think both Rowling fans, and general magic aficionados will both be a bit disappointed that more time wasn't given to their particular obsession, which breaks down to about 70% Potter and 30% magic in general. They try to weave the two together, but it didn't quite work for me. Your mileage may vary, but I think it's worth a look. Just don't over-expect.